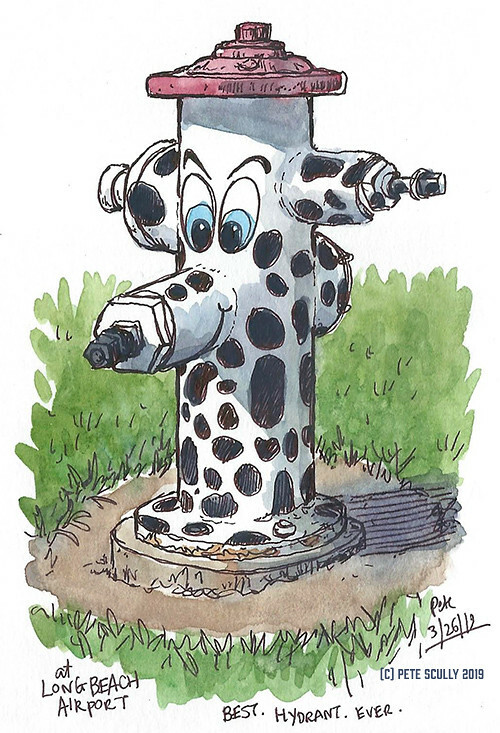 A doggie-themed fire hydrant!! It was in a little fenced off grassy area designed for pets to go pee-pee. 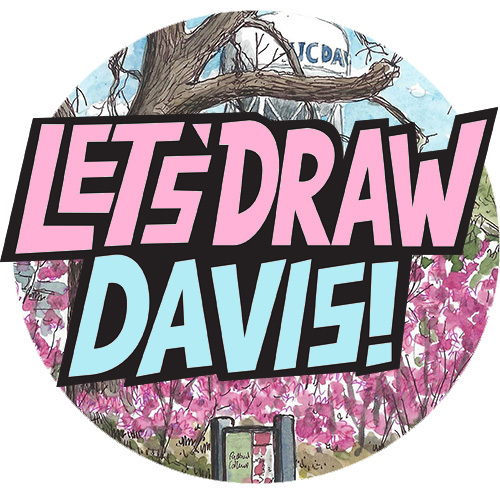 Now as someone who sits sketching hydrants and getting t know them quite well, I’m always one to roll eyes at the boring tired cliche of dogs weeing against hydrants, but this is just amazing. Except actually I really hope dogs don’t wee against this one, gross. But isn’t this the best hydrant you’ve ever seen? I never thought I’d see one so cool. Another one to add to the collection. 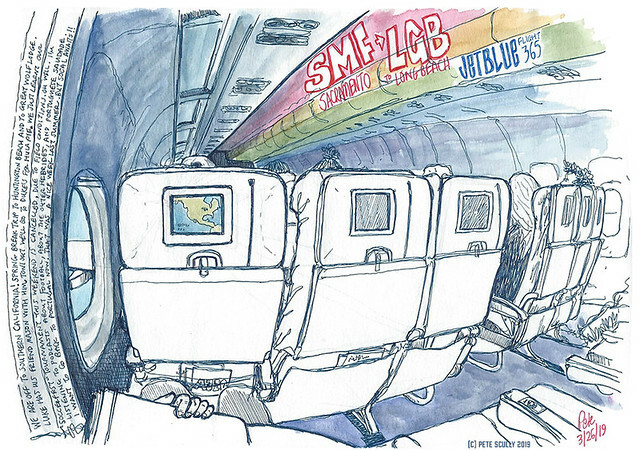 Here is another JetBlue plane, which I sketched while waiting to board for the flight home. I’ll post the beach sketches later, just imagine them (yellow at the bottom, light blue at the top). This one was drawn, like the top one, in the dark blue uni-ball signo pen, it looks really nice on the paper. I have quite a few planes in this sketchbook now, and with those wings you have to draw them over a two-page spread. You can see where the page break is. I spend a lot of time in airports, on airplanes, up in the sky. I remember being a kid and being terrified of the very thought of flying (despite being obsessed with air force jet planes), I was so scared of planes that I would not let anyone else in my family fly. When I was six my older sister was going away somewhere, a school trip to Germany I think, and I wouldn’t let her leave the house, cried my eyes out, I was hysterical at the thought of her flying. She eventually went, and I’m glad she did, because from Germany she brought back this amazing stuff called ‘Nutella’ I had never seen before, and started my lifelong love of this mysterious ‘Nutella’. When I was 10, my family finally convinced me to fly, and I got in my first ever plane, flying to Ibiza off the coast of Spain. They took me to see the pilot in the cockpit (it was the 1980s, they probably would have let me fly the plane), and I’ll never forget the pilot asked if I wanted to see out of the window, and I said yeah, and so he just tilted the whole plane sideways! I thought that was cool, but everyone back int he cabin were freaking out a little bit. After that, I was fine. No idea how many planes I’ve been on since. I don’t really like flying, but it’s more that I don’t like the hassle of airports, I’m not a fan of taking off and landing, but the bit in the sky I’m totally fine with. And so, New York City. Walked outside a packed Penn Station into billions of people and torrrential rain, rain so hard those tall buildings had no top or even middle. Hilarious, I didn’t care, I was in New York and New York is cool. It felt like London, only taller. Walked down fifth a little bit, taking dark grey photos, running in and out of postcard shops, counting yellow taxis (not really counting, but you know, there were a lot). I just had to draw, it’s why I was there. So out came the little blue chair, underneath a narrow shelter by a coffee shop, right next to a hot dog stand (as New York as it comes). 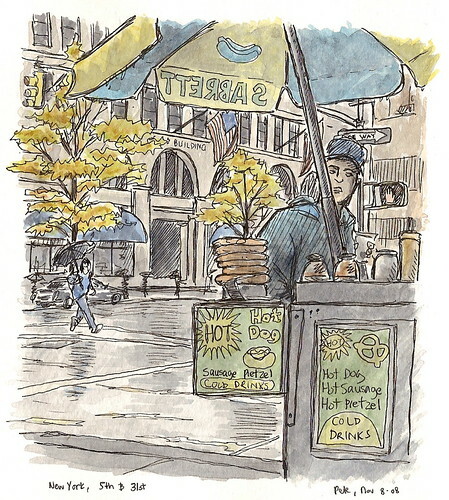 Below, a sketch made outside Long Beach station, before taking Long Island Railroad in to this rainy rainy metropolis. We went to the opposite end of the country this past weekend, to New York. I love New York. I want one for Christmas. 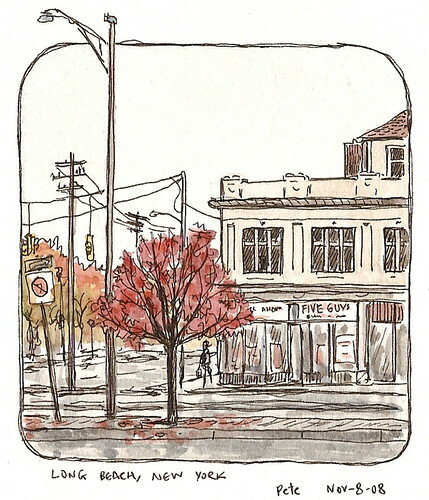 I did a lot of sketching in the city, in rain and shine and falling leaves; those will come later. 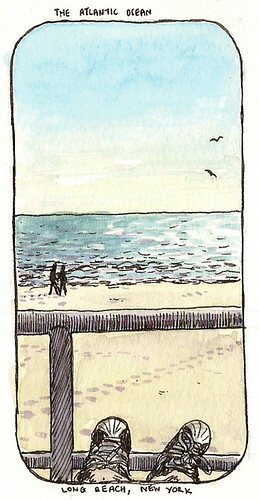 We stayed out in Long Beach, on Long Island. 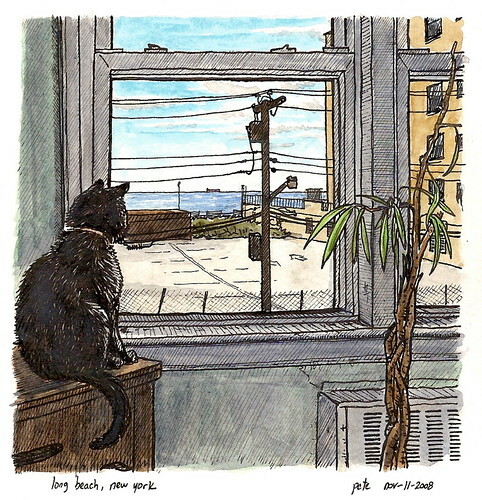 Above, the view from my sister-in-law’s apartment window, as viewed by max the cat. Long Beach is really that – a very long beach. I was last here six years ago, at Christmas, when thick snowed piled in on Christmas day, and we were throwing snowballs on the beach on the 26th. You can hear that Long Island accent everywhere, dawgs and pawks and cawffee, it’s so cool (while in New York City, most accents I heard were actually British). It was cold, but not that cold, not yet – the fall leaves were deep red and bright yellow. But you know you’re not in California any more, when you see people wearing coats that look like sleeping bags with sleeves, and the heating in donut shops is slightly higher than the surface of venus. You need the cold sea air to cool you down. I was watching the Godfather last night; I didn’t realise before, the Corleone’s lived in Long Beach, in the movie. I do love to be beside the seaside. For us, it was always the North Sea, or the Channel, but here it’s the Ocean, be it the Pacific or the Atlantic – even their seas are bigger in America. It’s funny, but looking out at the Atlantic I felt more of a connection, that home was just over there across this watery desert, rather than on the other side of the world. Then I thought, you do a lot of thinking when looking at the sea. And then I thought about Seinfeld, how whenever he had to do some deep thinking (such as that one where he has to decide whether or not to give up making silly “hello” voices about his girlfriend’s belly-button), he’d come and look at the ocean. All this thinking was making my brain cells nervous, so I met the others, and went and had a burrito.